Reshu Singh says that she enjoys “making marks on paper”. And what beautiful marks she makes. In a soft-spoken presentation, the talented artist and illustrator gave us a peek into how she looks at art, and what motivates her. She began with the work of artists she admires, and smiles abounded around the studio as Sir Quentin Blake’s infectiously happy art graced the screen. She drew attention to his playful lines and his fidelity to the essence of the character over dry anatomical precision. She spoke of Mickey Patel’s textured illustrative style and striking compositions, and then showed us the exaggerated features and unique pencilled quality of Ukrainian artist Artem Krepkij’s work. 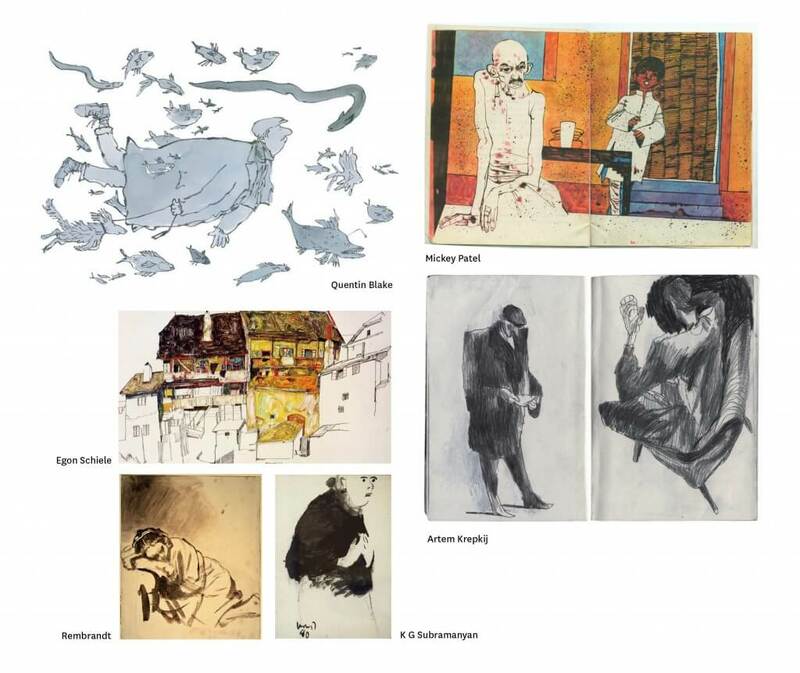 Bringing up the rear of this eclectic list were artists as diverse as Rembrandt, Egon Schiele and K G Subramanyan. 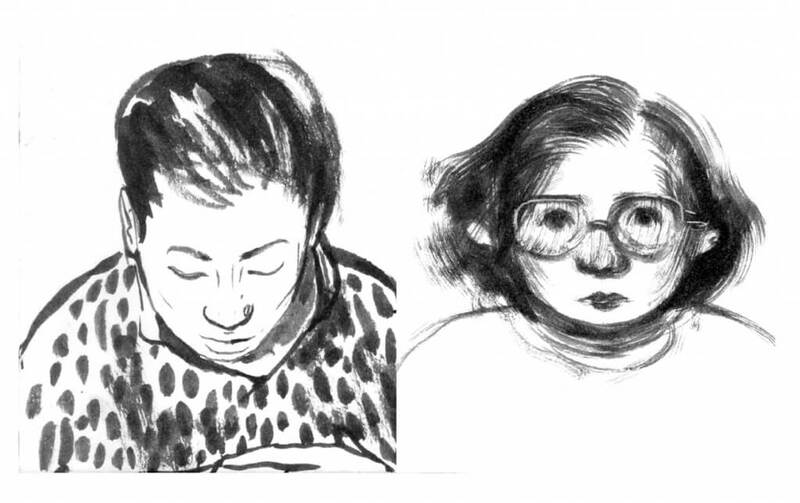 When it came to her own work, Reshu spoke about her love for drawing. She described how drawing helped her express herself, and generate ideas. She showed us some sketches she made from life, and spoke about how she always started with the part she liked—a strand of hair, a hand, a foot. She shared a variety of sketches and paintings, displaying her use of different techniques and different media, capitalising on the unique characteristic of each. She then moved on to projects that she had worked on, beginning with her illustrative work for an essay on expletives in North India—the colourful language reflected in her artwork—for which she used photographs of her parents’ wedding as reference. 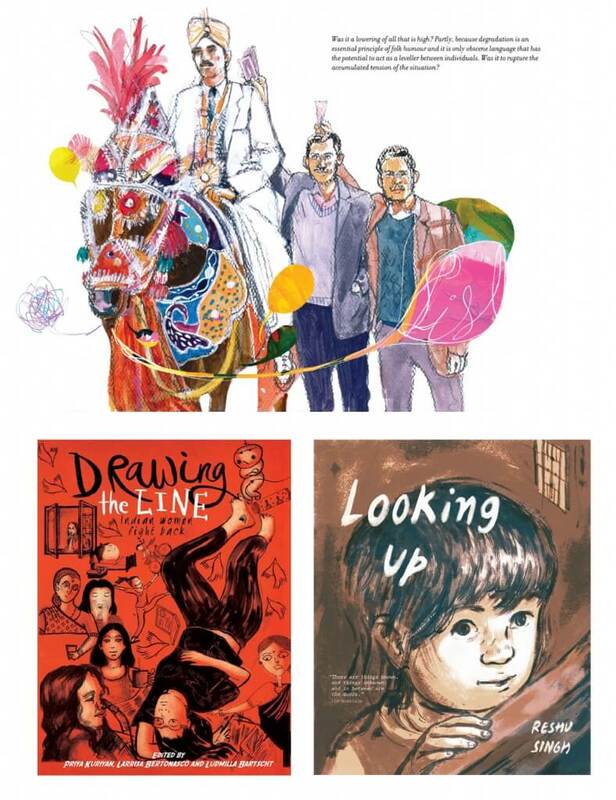 She showed us snippets from the personal narrative, “Drawing the Line”, published by Zubaan, with its free-flowing lines and organic compositions. Reshu ended her talk with ‘Looking Up’—her contribution to Spring magazine in an all-female Indian-German artists’ collaboration. A story about her and her grandmother, her piece was an apt showcase of the personal and expressive nature of her work. People Tree founders and all-round #lifegoals, Orijit and Gurpreet could have just narrated stories and incidents from their decidedly colourful life and that would have sufficed. And while they did share some tales, they’d also brought along work to share. 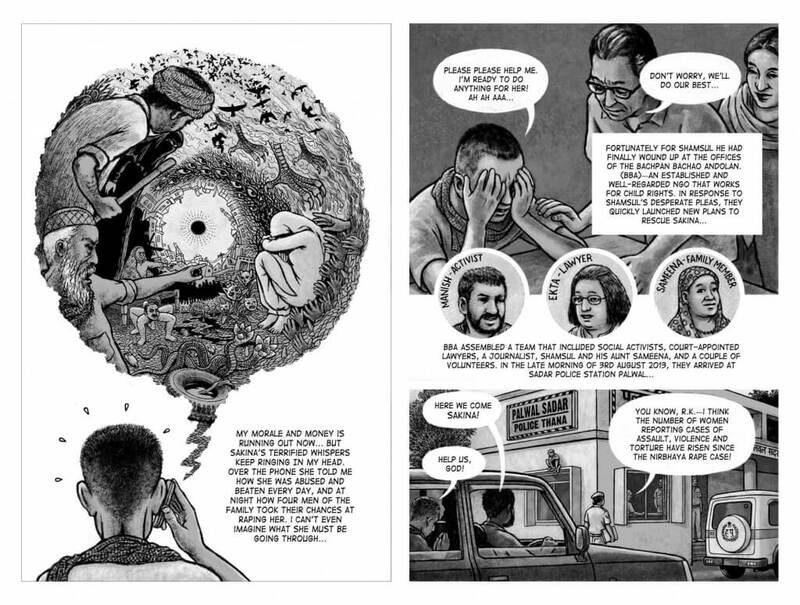 “First-Hand” is an anthology of non-fiction graphic narratives, the first of its kind in India, that narrates the stories of people whose voices have been lost in the drone of a 24-hour news cycle. 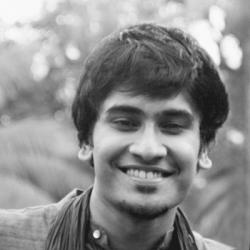 Orijit was one of the editors (along with Vidyan Sabhaney, speaker at Show & Tell #16). His presentation, however, focused only on one of the stories—the one for which he had done the artwork: The Girl Not From Madras. The narrative is based on a true story, as written by Neha Dixit. The original article was about the search and rescue of an Assamese girl who had been trafficked to a family in Haryana. 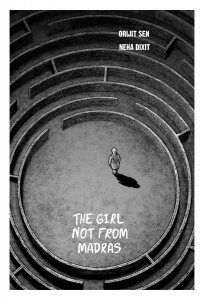 However, Orijit’s take starts earlier in the story of the titular girl, delving into her experiences and fears even as she left her hometown. As a result, we get a deeper, more human glimpse of Sakina. Orijit talked us through the storytelling devices he employed, chief among them the introduction of a narrator called “Laadli”, characterised as a female superhero. He took us through the disturbing story of a young girl forced to leave everything familiar and dear, bought by a family who treated her as less than human. The narrative weaves through marketplaces and trains and police stations, and arrives at a bittersweet end. And no matter how unsettling the content, the reader has no choice but to be immersed in this gritty world, due to Orijit’s rich, textured artwork with unexpected compositions and incredible attention to detail (the postures! the hands!). Everyone present in the studio on that Saturday got a pre-release sneak peek of First Hand, but in the time that it has taken for me to finally get around to this blog post, the book has been launched. It’s a remarkable project, and can be supported here. Gurpreet then joined Orijit, and talked us through the journey of People Tree. Born in 1990 as an escape from “the impositions and demands of (heartless) markets and (artless) clients”, the studio-shop has now carved out a space for itself as an independent business combining socio-ecological purpose with collective creativity. Gurpreet spoke of their initial disillusionment with the practice of design, and how, in those days, Delhi lacked a space for young people to talk, share ideas, and get politicised (“not a dirty word!”). She described how People Tree began at Connaught Circle, the perplexed questions they initially faced (“You paint T-Shirts for a living? !”) and the kind of space it eventually became—for people of all sorts and all backgrounds (“except extreme right-wingers and homophobes, of course”) to come together and channel their collective dissatisfaction into creating something. 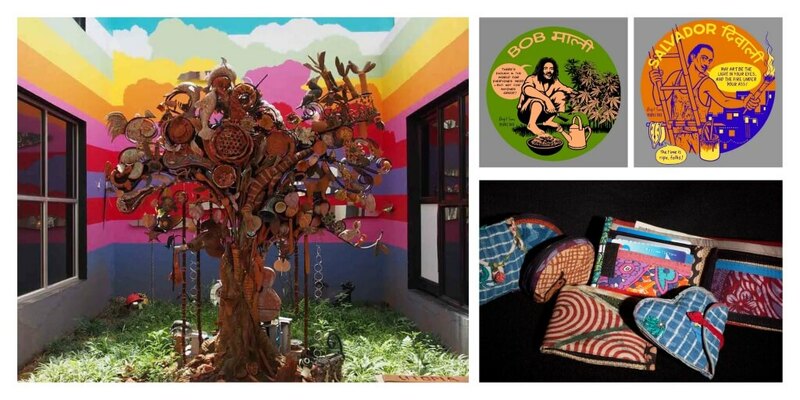 These ideas and ideals of People Tree were crystallised in our mind by the kind of work Gurpreet went on to show. 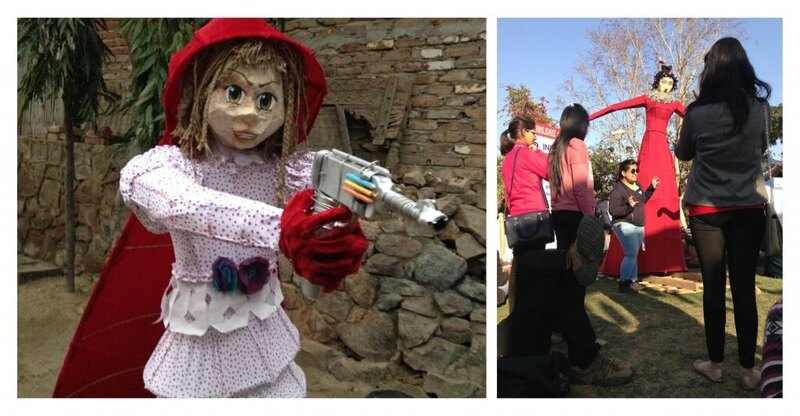 We saw the larger-than-life sculptures of famous literary figures created for the Jaipur Literature Fest, made with recycled materials and found objects (my favourite: a murderous Red Riding Hood’s pencil-colour bullets), and the unique utopian/dystopian tree made in Goa out of the household objects of a group of unlikely ‘artists’: home-makers, engineers etc. The late Chesley Bonestell (pronounced ‘Bone-ess-tell’) has a fan in Codesigner Siddharth, who gave us a glimpse of his work and legacy. An artist and illustrator, Bonestell is considered one of the fathers of modern space art. 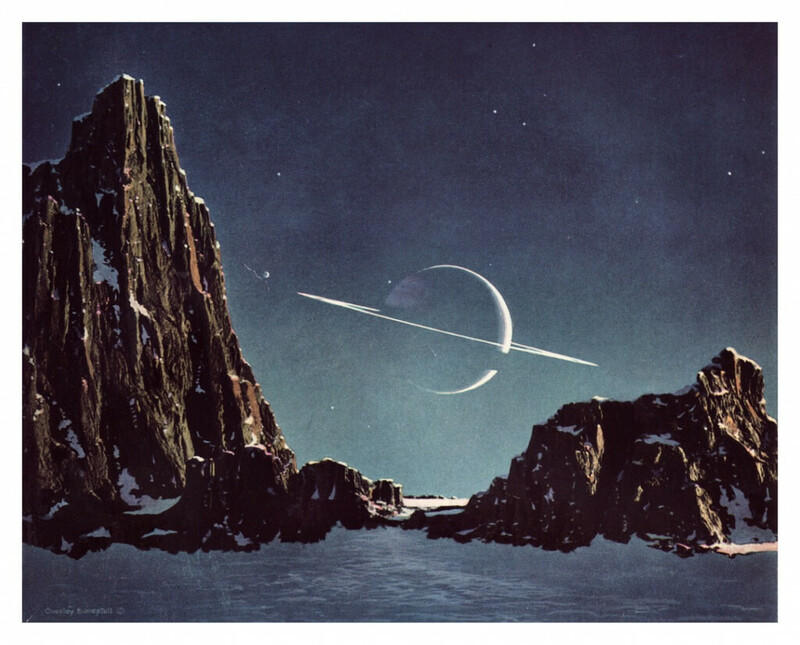 Sid explained how, given the primitive quality of space imagery available back then, Bonestell had very little visual data from which to construct his images, depending instead on interpreting and extrapolating from technical data. However, his work never indulged flights of fancy at the cost of scientific accuracy. In spite of, or more probably, because of this, he created pictures the likes of which had not been seen before. Such work was critical in capturing the public imagination, and is credited with being part of the inspiration behind the American space program. We were introduced to the grandeur of his extra-terrestrial landscapes, which he depicted long before today’s advanced space imagery came along and dulled the novelty of such otherworldly images. We came to know of his laborious process, which included hand-made models and precise lighting. We saw how his work was the inspiration for Destination Moon—both the film, and the Tintin adventure (much to the dismay of a Hergé fan in the audience). As it turns out, Chesley Bonestell kept a tight leash on the producers of the film, ensuring that they depict the moon with scientific fidelity. “I think he’s been there,” quipped one of the screenplay writers, in a clip Sid shared. The evening concluded with the diverse milieu that typifies a Show & Tell guest list retreating into the imaginary breeze of the lawn, for drinks and dialogue.